The 2018 Global Talent Competitiveness Index (GTCI) produced by INSEAD Business School in partnership with The Adecco Group and Tata Communications brings the following key messages emerging from the GTCI 2018 report: Switzerland and Singapore remained at the top of the raniking. • Message 2: It is above all cognitive diversity (diversity of knowledge, experience, and perspectives) that, through teamwork and collaboration, leads to innovation and outstanding performance. Teams of diverse people outperform teams of talented but similar people. The GTCI assesses cognitive diversity across the world indirectly through measures of collaboration within and across organisations; it also measures attention to gender diversity.28 It points towards the relatively slow pace at which progress is made in leveraging potential benefits from such diversities. Awareness and active strategies are required. • Message 3: Inclusion and diversity go hand in hand when it comes to diversity strategies. The difference between the two can be summarised as ’diversity is being invited to the party, but inclusion is being asked to dance’. To leverage diversity, organisations have to build more inclusive norms and cultures where voices will be heard without the filter of unconscious bias. More inclusive organisations will help remove the obstacles to identity diversity (gender, ethnicity, age, etc.). Organisations are also organising work around agile project teams to harness the benefits of diversity, but the payoff in terms of innovation and performance requires more inclusive norms. • Message 4: Formal educational systems (from kindergarten to tertiary education) have a crucial responsibility in building the competences (knowledge + skills + attitude) that are needed for a more inclusive world.29 These formal educational systems should be accompanied by more systematic and pervasive diversity training in organisations (focused on developing respect for identity differences such as gender, culture and ethnicity, as well as awareness of our unconscious biases) as well as vital training in collaborative skills. • Message 5: The capacity to leverage diversity requires bold and visionary leadership—at the level of organisations, cities, and nations. By themselves, the natural forces of society will not lead to diversity and inclusiveness. To the contrary: in the absence of such leadership, similar people tend to cluster together in the shape of tribes, cliques, and cohorts. • Message 6: Cities will continue to change the global talent scene. Municipal leadership and local engagement will be key in their success. The energy deployed by mayors and associated teams have characterised the efforts made by some of the high performers of the Global Cities Talent Competitiveness Index (GCTCI). Such leadership has often been visible enough to entice entire communities to combine forces to project a positive and attractive image of their respective cities. This will continue to be a key ingredient for the success of cities aiming to become global talent hubs. • Message 7: Cities are perfect labs to promote diversity. The experience of cities of different sizes and historical backgrounds shows how much diversity can contribute to innovation. In many cities around the world, promoting diversity has led to significant advances, especially from the point of view of inclusion: concepts such as ‘inclusive prosperity’ or smart cities’ need to be revisited from that particular angle. These concepts provide ample room for concertation with local stakeholders. 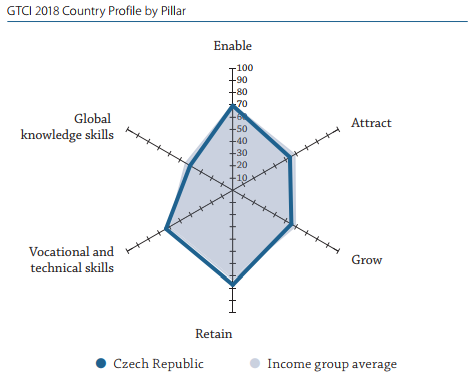 According to the report, in 2018, the Czech Republic ranks 25 in the overall ranking, compared with 23rd place in 2017. The country gained the lowest scores for category Global Knowledge Skills (rank 33 in 2018, rank 30 in 2017). 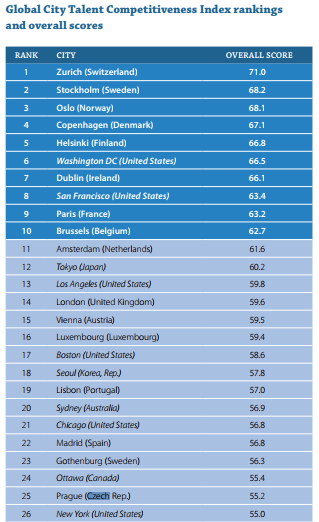 In the ranking of cities, in 2018, Prague ranks 25th, up compared with 2017, and Brno ranks 51st, down compared with 2017. The capital city Prague got high scores for Quality of Life and Environmental Quality, Brno for Environmental Quality, among others. Read full 2018 report. Compare with the 2017 results.